Within many aspects of traveling, I enjoy the connection with people along the way. 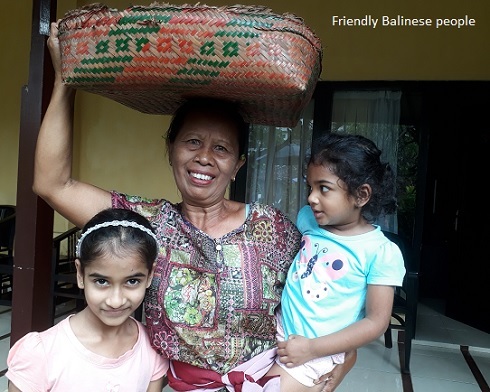 In my recent travel to Bali was of no difference when it comes to the joy of meeting new people and listening to their stories. Bala was the Taxi driver who took us to the Airport. 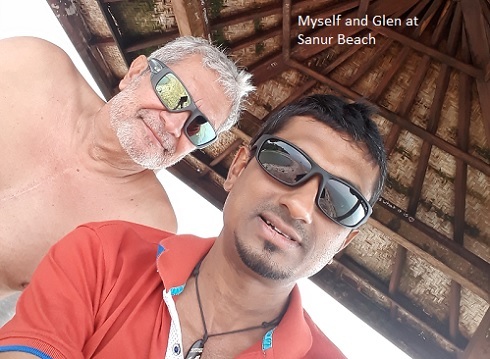 He was a Sri Lankan Born Australian guy: generous and talkative. He keeps his Taxi like a Temple. My biggest worry was if my kids make this brand new looking car a mess within few minutes. Even in winter, he gets up at 5am to wash the car before taking to the road. He shared his touching story with us. Bala wished us safe journey and promised to pick us on our way back. Even before leaving the Sydney Airport, we started to make more friends. 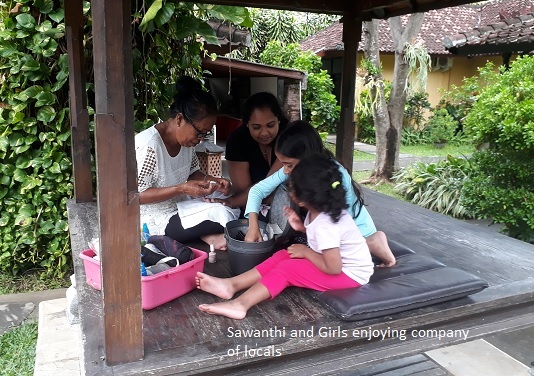 Actually, it was my daughters who exchanged their cheeky smiles with a matured couple who ended up being friends and helped us planning the coming days since it was our first time in Bali. Glen and Angi were matured couple who spend their winter in Bali, escaping the cold weather of Sydney. The hotel we stayed was a sister hotel of the hotel, Basaki, where Glen and Angi had their own apartment. In fact, we met few times in Basaki beach where we liked their company so much. Though Glen was much older to me, he was a good company, person full of sense of humor. Glen had many more stories like this. He also introduced me to many locals and Angi helped Sawanthi to find out good places for shopping. If you start shopping without your homework, experience may not be good. Some places even reminded me of World Market in Pettah, Colombo. You will definitely pushed by traders to buy unwanted stuff, twice the price. Bali of course reminds you of Colombo in many aspects. Balineise locals are friendly and helpful people. They are Hindu’s (though different from Hindus we find in Sri Lanka/India) who are very religious. In fact, their life is devoted for a religious life. 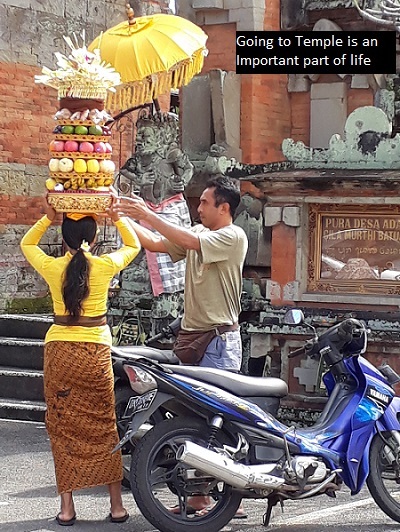 Some Balinese housewives used to visit Temple three times a day. Most houses have their own small temple within the house premises. As I heard, people who moved to Bali from the main land with the intention of earning money in various means related to tourism are the people who try to trick you in most cases. One of the most incredible abilities they got is identifying first timers. Within hundreds of people taxi driver will spot the new travelers and try to sell his service. There are a lot of westerners live in Bali, well-adapted. Our driver who took us to Rice terraces in mountains was a very friendly young guy called Putu. He was not only providing the chauffer service, but giving us all kinds of important cultural and historical details on attractions. If necessary he is also looking after our daughters while we are busy enjoying the new found interesting things. 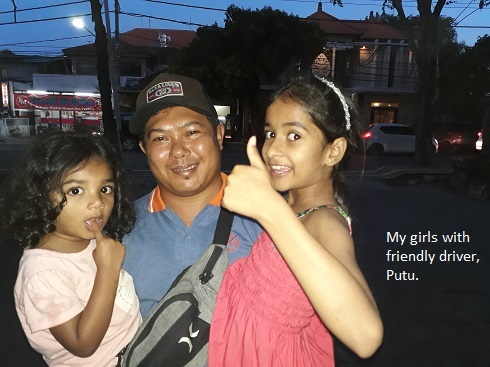 Putu loves kids and knew how to be friendly with them. He is newly wedded and waiting badly to have a baby of his own. Before marrying he has worked as a barman in one of the luxury cruisers enabled him visiting many parts of the world. On our day tour we had lunch in one of the exclusive local restaurants, very Balinese style. We invited Putu to join us and he was seemed quite honored and emotional. We realized it’s not the case in other occasions. 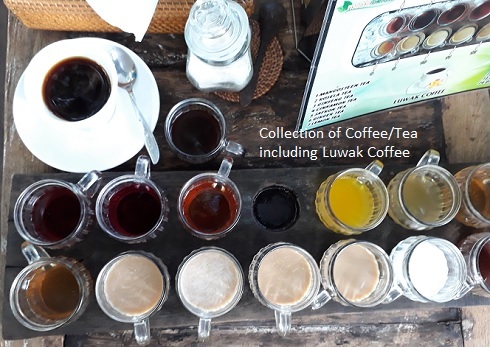 One other interesting thing in Indonesia is Luvak Coffee. Luvak is a mongoose like animal kept in cages in coffee plantations. Coffee beans are given them as food. Then droppings are being collected, where you find coffee beans as they were, in same nutty shape. They are then used to make special coffee called Luvak coffee which is one of the most expensive ones in the world. Its taste was bit more smoky for me. After enjoying all these newfound serendipities in Bali, we headed back to Sydney in Gauruda Indenesia Air Line with nothing but amazingly friendly staff. Sydney Air Port was so crowded in the early morning as usual and we had to spend hours in the queues. Girls were exhausted with lack of sleep. Then we saw one of the great scenes someone at that situation could ever imagine… It was Bala with tray of Coffee on his hands in the arrival gate… Good morning Guys.. welcome back to Sydney! What you get . .